For three people, mom, Carole and my brother, Dan, your boxes came today. We often malign the post. The post office cries that they are bleeding money so rates need to be raised. You go to ship a box to your daughter and not all the windows are open. Then, with the line out the door and into the other room, one of the clerks says just loudly enough so people can hear it, "Time for my break" and closes. You have to wonder where their sense of customer service is. I know they have rules about how long you can work before you are entitled to a break and the rules were put in place so former abuses can never come back. Still, even the most ardent support can't be blamed for become annoyed when it appears that customers, the ones paying the salary, are left behind because it's break time. I thought about market share and perception as I watched the postman look for the package or packages that needed delivery at this end of the block. I had an inkling there would be something for me in his truck because my mother had said my brother had posted his gift on Monday. I just watched. 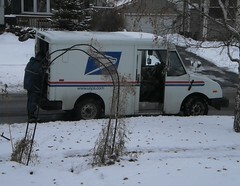 I began to actually feel somewhat sorry for this guy, who is not the regular mailman on my route. He gets Thursdays off. I could see he had many boxes lining the walls of this truck. He moved things. He stacked things. He looked at a piece of paper and then at the boxes in the truck. He climbed in. He climbed out. Finally, he emerged with 3 small parcels and came up to my door. Now, I don't have the whole walk shoveled. I know I should and I might get to it tomorrow, but I have half of it shoveled. As he came to the door, I opened it, took the boxes, thanked him and wished him a "Merry Christmas". I heard him distinctly say, "Bah" as he headed back to the truck. I'm willing to cut the guy some slack. This is not an easy job even if there isn't a holiday. How much more frustrating is it when there is a holiday that requires a lot of hauling of boxed and bagged items? We depend, as much as we are reliant upon email and other delivery services, on the US Postal Service. I don't want to pay 50 cents to mail a first class letter. I think that's ridiculous. But I'm also aware that it's not cheap to run a box from rural Iowa to suburban Chicago. So, while there was a "Bah", I still wish him a Merry Christmas. His is one of those jobs we never think too much about until it doesn't happen.